We see a lot of products that aren't entirely finished, or arrive with significant bugs, and are frequently reassured, "oh, that's just software." Not Wallflower. 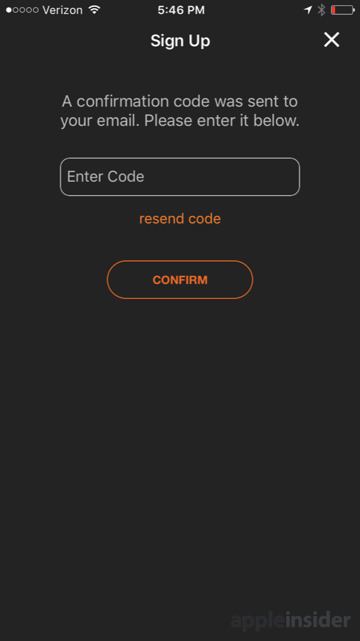 We didn't have to contact them at all, beyond getting their app through TestFlight. 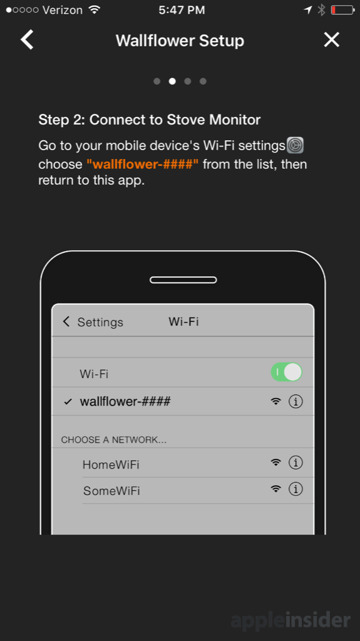 Everything about Wallflower worked exactly as expected. We can't tell you how refreshing that is. 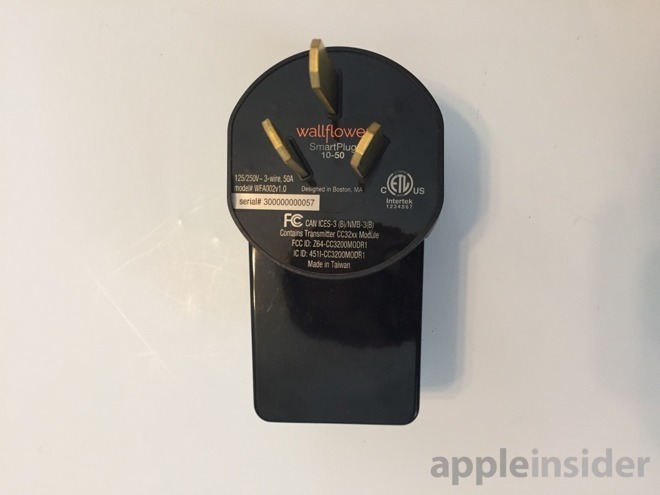 Wallflower is a very large 240V smart plug/socket meant for use with electric ovens and stoves like we have in North America. 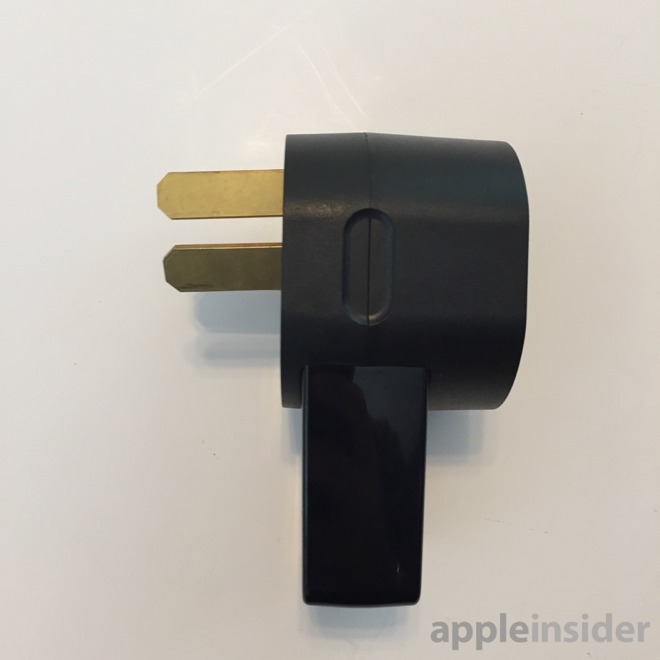 It comes in both 3-prong and 4-prong varieties. We were provided the 3-prong plug unit from the company. 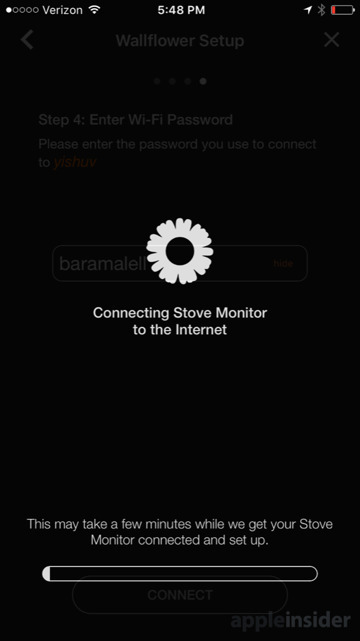 It joins a Wi-Fi network and then reports the stove is turned on when the electrical demand changes. Setup is simple. 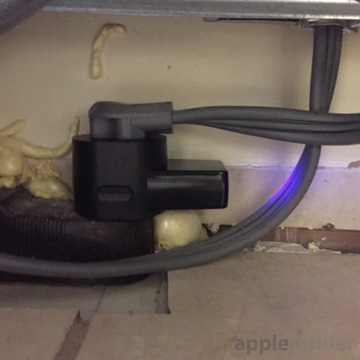 Remove the drawer from below the oven, unplug the appliance from its outlet, plug in Wallflower, and then plug the appliance into Wallflower. 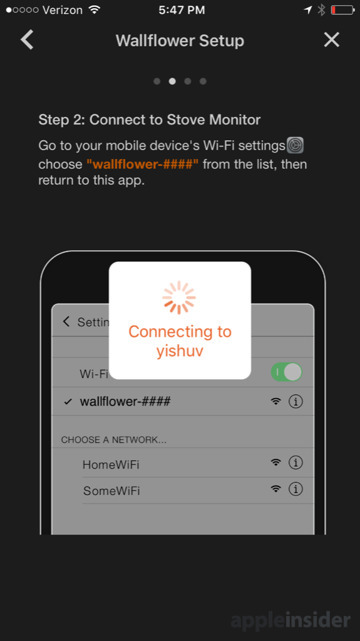 Change Wi-Fi on your iOS device temporarily to the ad-hoc network created by Wallflower, and the app will guide you through a few short steps, including account creation and setting Wallflower to join your home Wi-Fi network. 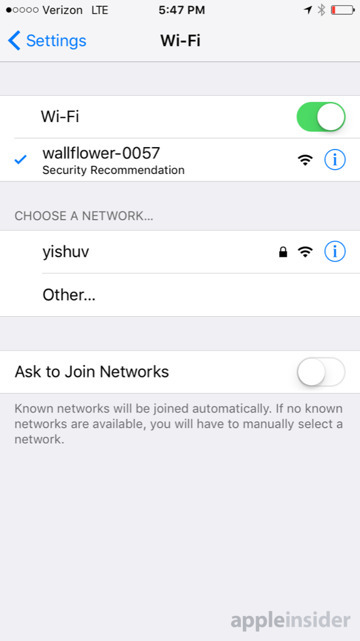 There are two LEDs on the unit, one of which changes color when Wallflower is successfully connected to the home Wi-Fi network. 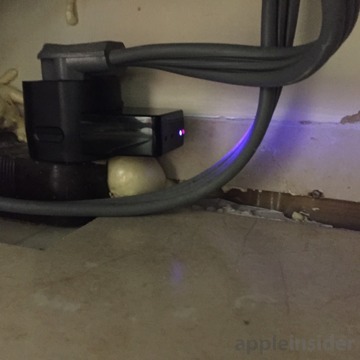 It's hidden under the oven, so we don't expect to ever see them once it's set up. 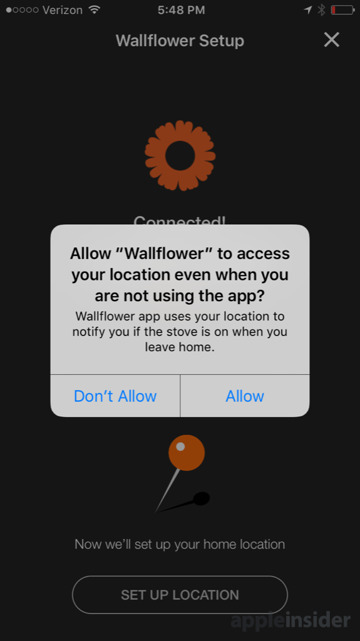 The app will also want to use your phone's location, so that it can geofence to let you know if you're leaving the house with the stove on. 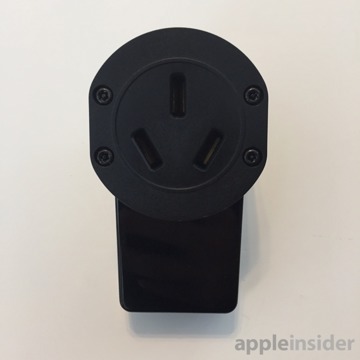 This was delightfully easy compared with some devices we've reviewed in the recent past. 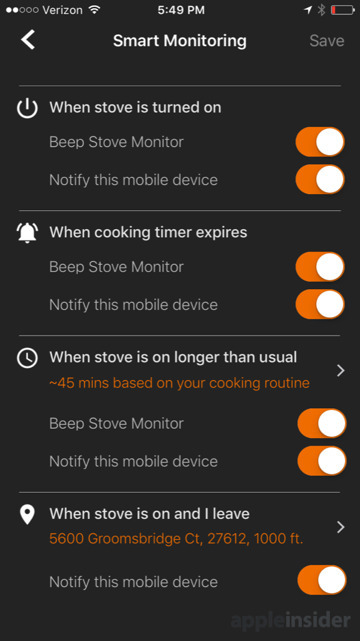 The default settings have Wallflower beep every time the stove is turned on. This is changeable in the app, but it's fine to leave it on. It scared this reviewer's wife initially, but when we talked about what Wallflower does, she immediately asked, "Can we get one for my parents?" It works well. 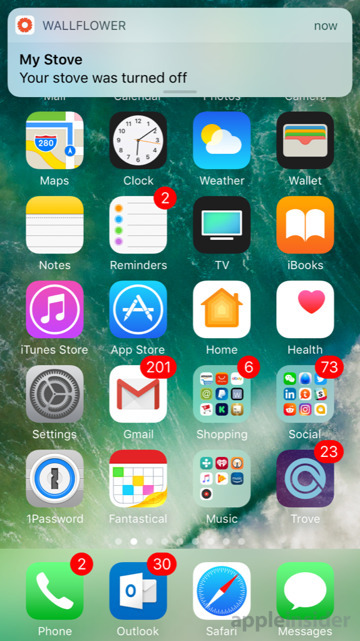 The phone with the app set up on it gets notifications both in and away from home. 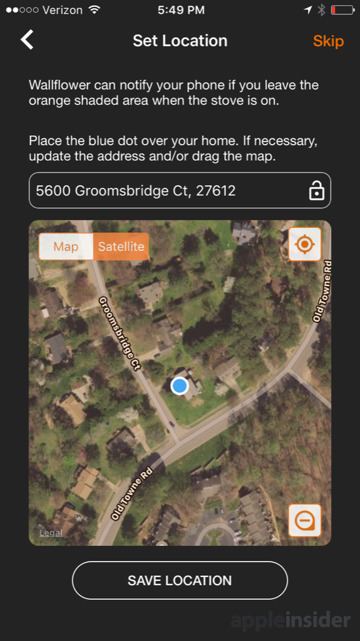 Geofencing works. 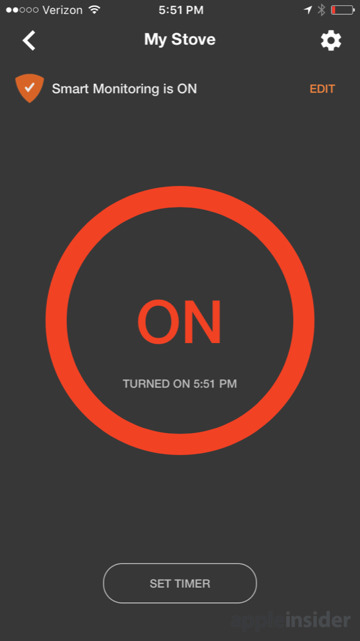 Leaving the home with the causes notifications to trigger, potentially preventing leaving it on due to forgetfulness. 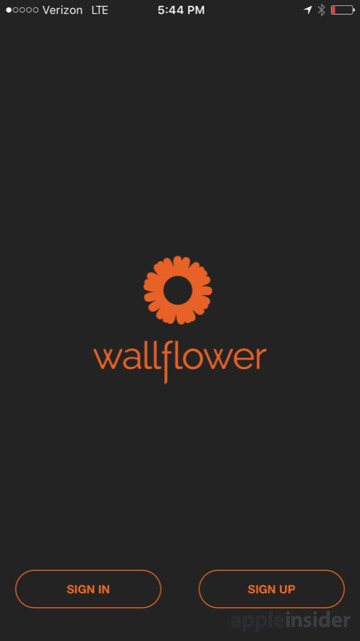 Wallflower says in their PR pitch, "A home fire occurs every 85 seconds, and cooking fires are the #1 cause of home fires. 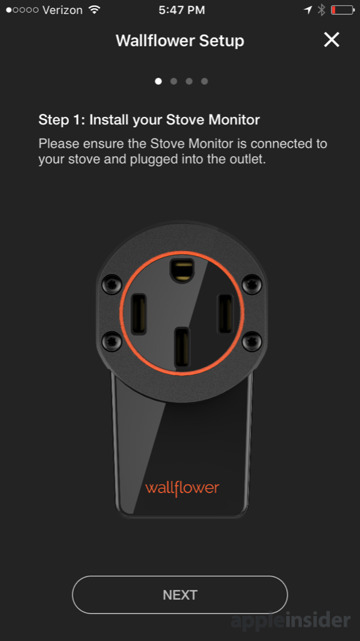 Wallflower is your first line of defense against cooking fires." And, it's important to note, even if you have amazing smoke detectors, by the time the smoke detector has been triggered, something is already potentially very wrong. If you have smart smoke detectors and you're notified while out of the house, that's even more time lost trying to get back to the house. 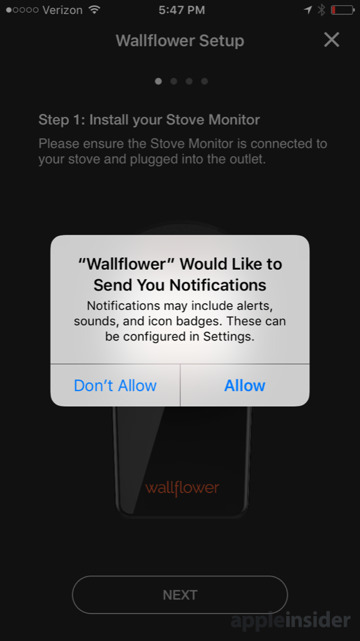 Having Wallflower notify you before a fire starts is much better. 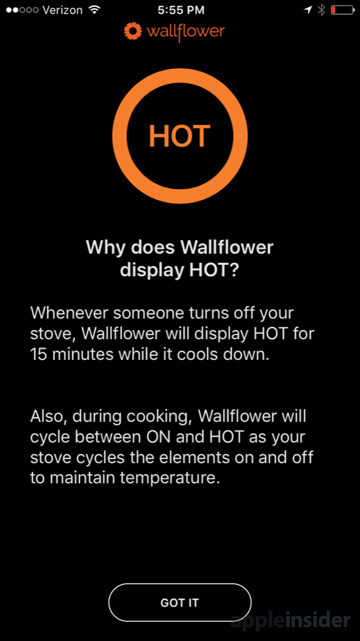 Wallflower doesn't let you remotely turn the oven on or off. 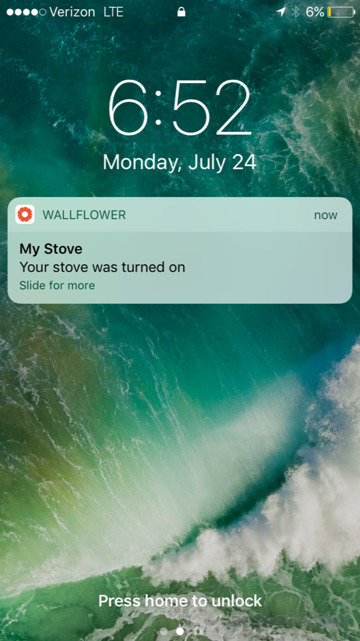 It's not that kind of smart switch. 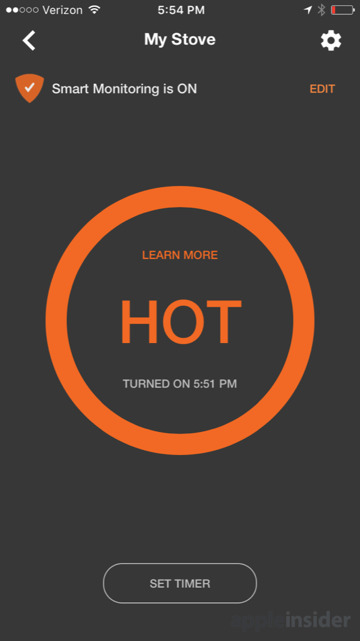 It simply alerts you to the power change and lets you take action based on the information. 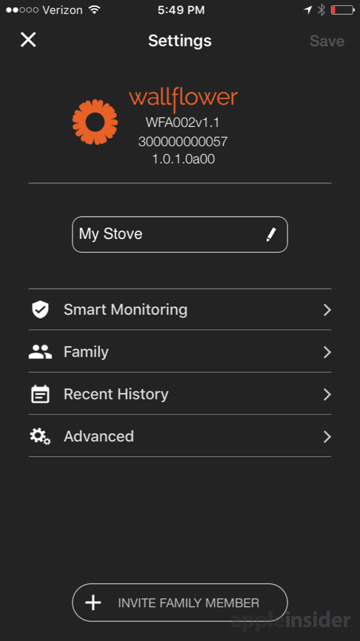 From an internet security standpoint, this is a good thing: we don't want a world where a device could be hacked and remotely turn on a stove to burn down a home. 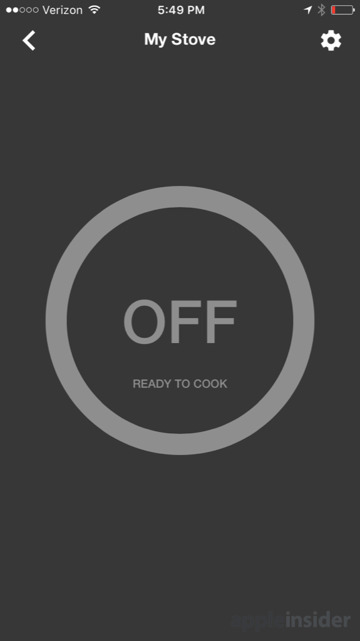 In fact, there's a lot of good criticism by twitter users about remotely turning on ovens. Here is @internetofshit talking about an oven that is compatible with Alexa and is remotely controllable. Rule of thumb: if you at any time think "I should turn on the stove while not physically being at the stove", you should not own a stove. A valid criticism is, if a HomeKit connected smartplug can be made and sold for $39 USD, how in the world is Wallflower worth $169 USD? You're right if you think that's expensive. 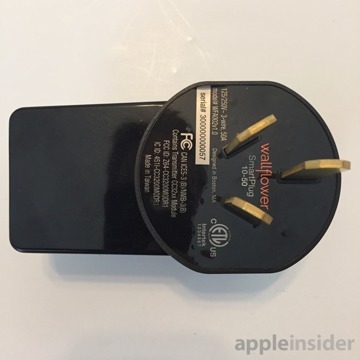 It's important to note that unlike the hour I spent attempting to update a single HomeKit smartplug firmware so that it would get on Wi-Fi again, which seems to be a ritual that has to be performed every 3-6 months or so, Wallflower just works. 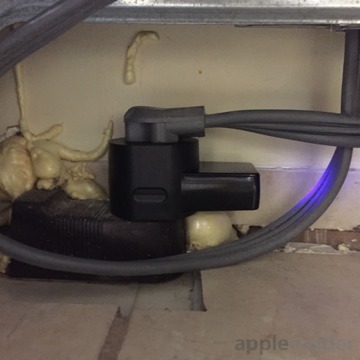 Seriously, the HomeKit smartplugs have been brilliant when they work, and frustrating when they don't. I find that almost all of them don't reconnect to Wi-Fi following power failure, forget their power state, and require a 2.4gHz network in order to function. All this is to say, for $39, they aren't without pain. By comparison, Wallflower does just what it says it does and does it well. 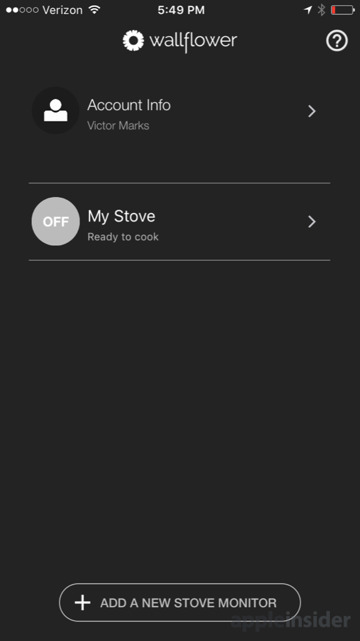 HomeKit wouldn't add any useful function. What would you have it do, be a trigger for another device (ex. if the stove is on, turn ceiling fan on)? 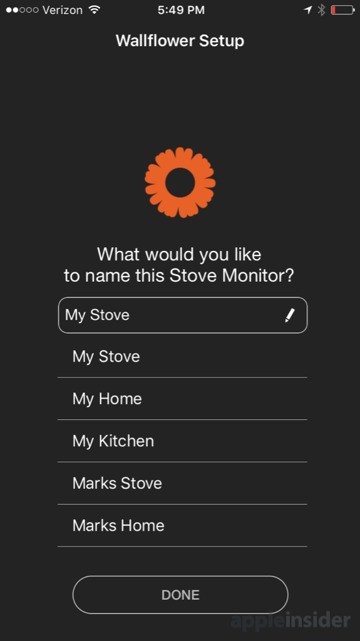 We want HomeKit on as many things as possible, but this one doesn't need it and wouldn't benefit from it. We spent some time trying to figure out how they could make it be remotely switch-off-able without being vulnerable to remote switch on. We couldn't see how that possibility could be prevented. 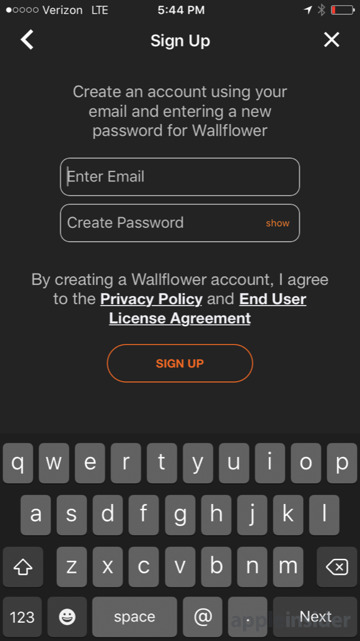 Should it be possible for Wallflower to cost less? Yes. Does it need more functionality? Not unless there's some way to permit remote turn-off without allowing for the possibility of remote turn-on. Here, for safety, the whole question is avoided by is being pass-through for power, vampiring a little power for its Wi-Fi and microcontroller, and measuring the amps drawn by the appliance. The second you add relays to turn the socket on and off, you start to open up vulnerabilities that aren't present currently. 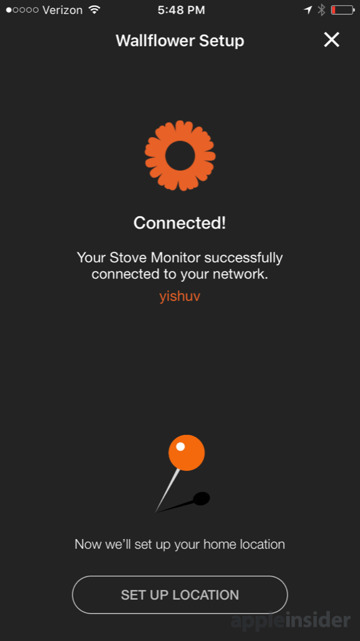 Wallflower does exactly what it says it will: It notifies you when the stove is on. 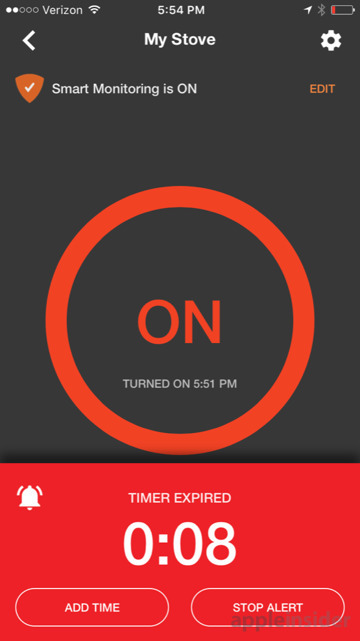 It notifies you when it's on longer than it should be. 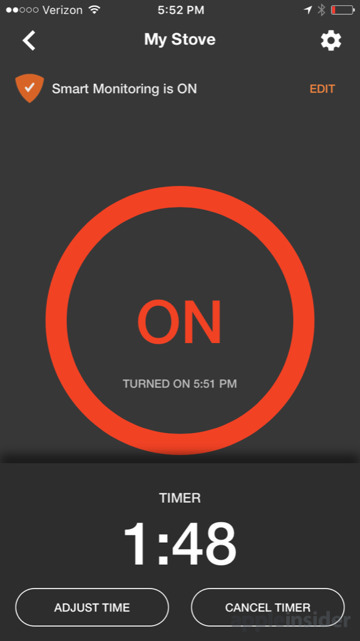 It notifies you when you leave the house with it on, and it notifies you when it turns off. It sounds simple, which is a good thing. We're ready for products about which we can say, "it just works." If you're the sort of person who wonders if you left an iron plugged in, wonders if the stove was turned on, or has ever returned home to check that you locked the door when you left, this might be for you. If it prevents a fire, it's worth the asking price. We're left with a sort of reviewer's quandary: If a device does everything it says it does, does it well, but costs more than it should, is it a 5 star device? For some people, no. Would we spend $169 on it? After talking it over with close friends and family, we got a range of numbers on what people would be willing to spend on such a thing. Consensus placed it at under $100, and some people would only be ready to buy it if it were in the $60-70 price range. That is, it's more than double what people think it should cost. To separate it out, let's think about the product and what it does separately from price and value. The product is a 5 star product for what it sets out to do and accomplishes. At the same time, the price is higher than the small number of people surveyed will bear. If an oven and stove combination appliance costs $599 (a number chosen by browsing home improvement store sites), Wallflower costs 28% the cost of that appliance. For that reason, we're docking a star. 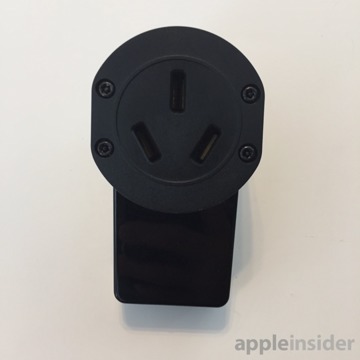 Wallflower costs $169, and is available today at wallflower.com.